Another summer comes to a close and with it comes a trip to South America. I just wrapped up my first week in Portillo and am now headed to Valle Nevado and La Parva to have a few more days on snow before finally heading to Corralco to compete in the Brazilian Championships/South America's Cup Finals. It's been a great week hanging out with some great spring snow. Nothing puts a smile on my face more than getting back on snow. Since the granite company has been growing like crazy in Austin, it has taken a little more time and resources than I would like but I know it will pay dividends down the road. Portillo was a great first stop on the trip. I felt as though riding more rough big mountain spring conditions would really benefit going into a rough spring track, we shall see. While I rode my Jones Flagship 90% of the time, I had an opportunity to pull out the Oxess and let it fly for a little while.... nothing rides better than a custom race deck. Met some new people and made some great new friends. On our final day we managed to hike the Super C couloir, which although no new snow has been seen in Portillo in quite a while was a great way to cap the first week. Top of Super C with Aconcagua in the background. Enjoy the pictures and I will be sure to update this as the trip goes on! Jump to now... August 22. I'm on a 3 week snow shred SBX training mission to Chile with a number of other athletes from North America and 2 coaches. So far we have ridden Nevados de Chillan, Corralco, and are now at El Colorado for the next week and a half. Snow was stellar for the first few days instantly hopping into a powder day and then first flight of the season came by way of the South America's Cup in Corralco... Tomorrow we get to start training on the track here, looks pretty good but needs a little hand work. Everyone maybe wondering what has been going on and why the blog hasn’t been updated in a few weeks. After arriving back in Austin for a week, I received a call from my mother that my Grandfather was in the hospital. I wasn’t too concerned until after a phone call the next morning when I was told that he only had a 50% chance of surviving the pneumonia he had been diagnosed with and that I needed to head for Wisconsin immediately. Immediately for some people means booking a flight, for me it means fuel and strategy. My uncle booked a flight leaving Austin the following morning at 6am, meanwhile I grabbed my brother and was on the road within a few hours. The drive stretched 1,230 miles which we covered in 18 hours showing up at 6:45am. I was able to get to the hospital and spent the week there while my Grandpa looked like he was making a slow recovery. The hardest day of my life was saying goodbye, in a lucid moment he was able to talk to me like we were out for a cup of coffee or out on the back patio. I went back to Texas that next morning and flew back to Wisconsin 5 days just before he passed. My Grandfather has always been a great inspiration and influence in my life. The way I act, joke around, and talk to people is directly related to how much time I spent with him throughout my life. He was a World War II Navy veteran of the Pacific Theater, leader of the family, wearer of his heart on his sleeve, degenerate golfer, and retired for 30 years. It’s no coincidence that cars and road trips have been in my blood since I was old enough to hold a map, stories of driving through Milwaukee and navigating with an upside down map of central America still come up at the kitchen table. Journeys to the Upper Peninsula of Michigan for snowboarding or the 4th of July were never out of the question, let alone a 10pm trip to his favorite custard stand. The day I received my learner’s permit he threw me in the front seat of the caddy and had me drive him to Madison. A trip not just down a country road, but navigating towns, freeways, and traffic to see a cousin of his… I know he took that drive for me though. He bought me my first snowboard and made sure I always had a ride to the hill. Cold days of watching me compete with my parents, and longer days waiting to see me again while I was out on the road. After a long jump into Banff the journey down to Colorado was pretty un-eventful but long. We knew full well that this was the toughest part of the long road trip. 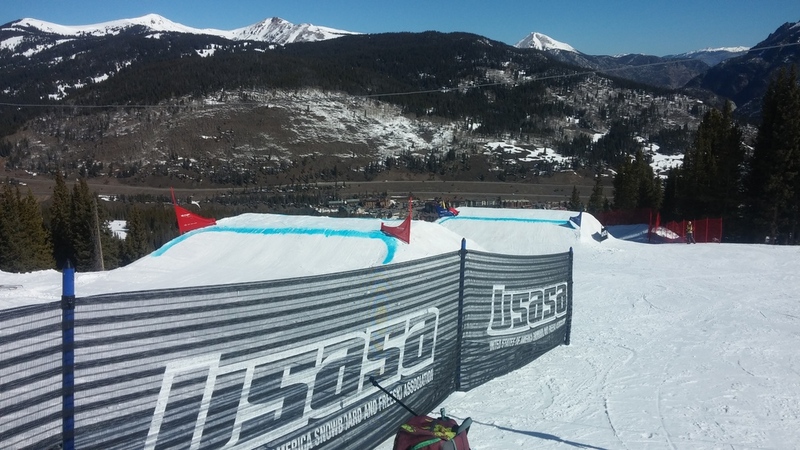 We had to be back to Copper to race the last stop of the Holeshot tour/NorAmCup/USASA Nationals. This was not ideal as we were supposed to have been racing a World Cup, and multiple NorAm stops in Squaw but the lack of snow through a damper on those well laid plans. The course at Copper was less than ideal when we first showed up. A first feature that shot you to the flats, and the remainder being a wide open banked slalom with little to no features. It was anyone’s game and put us all into some tight racing scenarios. 4 pack racing throughout the course could have made for some great spectator racing, however, miscommunications and lack of accessibility to foot traffic had very few people attending. In a sport where excitement lays throughout, and TV viewing is always high, our organizing bodies need to look into better media coverage for events. It is all well and good that the Grand Prix gets televised every 2 years or so, and the Olympics have it, and IF the US holds a World Cup that will get a TV spotlight. However, there are many more events globally and domestically which could fuel the sport and the amount of money being pumped into it through sponsorships/endorsements. After making it into the second round I found myself out after a bad turn and packing my bags. This is when crunch time came. The next race was a short 2 days drive away with 1500 miles to cover. We decided to hit the road hard, Copper to Salt Lake that night, up in the morning up to Post Falls, ID, and finally push onto Big White Canada. The drive was long but the scenery was great. Once in Big White weather had plagued us here all season long and this was no different. We had a course built for the public and a start section that was set to host a kindergarten race. None of us were too impressed and actually laughing at how slow it was. Well the boards didn’t run, and turn 4’s ruts put me down. I was not pleased but finished out another season on the NorAm Cup. The journey back to Texas saw us drive through Washington, Oregon, Cali, Arizona, New Mexico, and Finally across Texas. We were able to take our time and see some of the great parts of the states. The Pacific Coast Highway, The Redwood Forest, San Francisco, Yosemite and highways for miles. Some trips are long, this isn't a trip.... It's a journey. Well the beloved STI finally went, after months and months. It took less than 3 hours to get the new ride, a 2007 Audi A3 quattro. Needless to say the great state of Texas didn't make life any easier on me. I spent a week to 10 days off in Utah freeriding with Jonathan Cheever and Maria Ramberger and just trying to heal up before I took off for Colorado. With the lack of snow in Tahoe all plans of racing at Squaw were eliminated, giving all of the SBX family another few weeks to go , "now what". I left Utah on March 1 headed to CO to take some more time to freeride and just enjoy snowboarding for what it is and have fun with friends. On the way the STI was sold in Fort Collins and later that afternoon I purchased the new car in Denver. TEXAS wouldn't let me do a plate transfer without seeing the car first, in fact, they wouldnt even register the car without a safety inspection. What's a safety inspection you may ask? Let me explain.... does your vehicle have headlights? taillights? blinkers? seatbelts? do your brakes work? horn?.... I had to drive 2000+ miles for 8 minutes in an inspection station to make sure I had a working horn! I could have flown down, taken 1/4 of the time, and still registered my car. Texas, you need to get your shenanigans together, if I still lived in Wisconsin I could have handled my plate transfer over the phone. The next journey sees me travel, with Kellie in tow, 7200 miles in the next 25 days. Colorado twice, Banff, Big White, and all the fun places to hit on the way back to Austin. Stay tuned, the fun continues! Right now I’m sitting against the window of an old school S80 aircraft, a businessman sitting to my right, a child yelling in the background, and I have consumed myself in doing work. Well, let’s face it, my work is a lot better than most. I just flew back to my summer home to check up on my company, take a few meetings, and overall make sure things were running smoothly. Now I’m headed back to what everyone really wants to be doing, playing in the snow and having a good time while getting paid. In the past 30 days I have been to Canada twice, Colorado, Utah, and Texas. 2 trips by plane, 2 by car… my preferred method of travel. Riding this season has been a little sub-par by my own regards. Out of all the competitions so far going out in the first round or having qualifying crashes has not been great on self-esteem. The last races at Big White Resort near Kelowna, BC were almost cancelled due to adverse weather conditions where even after athletes had qualified to race visibility was down to less than 75 feet at points. Needless to say not ideal when your friends and acquaintances are going to be at an intimate distance of 6 inches or less with razor sharp snowboards attached to your feet sliding along at an average speed of 40mph. At the end of the day I had bruised ribs and a bruised shoulder. Both were hit twice, once on a day 1 crash. The second time while I was working through a heat and was taken down in turn 7. With the Granite business still going strong I’m headed back to Salt Lake City for a few weeks to get back on snow, then it looks like a fun shot to ride Aspen for a day or 2, some more CO snow, and then the rest of the competition season. Canada could come into play at least twice more as well as Colorado and a set of rescheduled NorAm races TBD. Look for more upcoming pictures and blog posts, hopefully this car will go and a new Audi can be thrown in the mix to close out the season. Where is all the snow in North America? So this winter has been a dry one and just not for me. The places to be are Jackson Hole, the East Coast, and Japan. Needless to say I've been in Salt Lake City and riding out of Park City Mountain Resort and the Canyons since the second week of January. Last week I traveled to Mont Tremblant, Quebec, Canada for the first stop of the North America's Cup. Although the course was nothing special it was a pretty good racing course allowing riders to stay together and race each other and not against the course. My 2 days of racing didn't quite go to plan, with a 1 run qualifier on the first day I went out with a crash in a rutted berm that saw a few others out as well. In day 2 Qualifying was 2 run qualifying and I made it to top 32 on the first run. Second run saw my face firmly implanted in the berm to end that run. Race time arrived and in a tight heat with a terrible gate choice I was in the mix until a costly error 1/2 way down the track saw that quickly disappear and turn into a quick way out in the first round. Now I'm back on the road and in Colorado for round 2. Enjoy the pictures and the video. You may think I'm ill from the title, but I'm not. I haven't posted anything in a little while but there has definitely been a few developments. My close friend Logan and I had thought we found a place to live in Breckenridge Colorado forJanuary and February. We signed a lease and submitted a deposit on the 22nd of December with a move in date of the 28th. All was right in the world, Christmas was the usual family affair of crossing Austin to show face and not really relaxing... maybe Kellie and I should leave town for the holidays? When we arrived in Breck a few short days later we walked in to collect our keys and found out that we had been scammed. The letterhead, the Realtor ID #, and even Breckenridge address were real, but the condo was not for rent and we were out a place to live and our money, which we are still trying to recover. The feeling of throwing up is the worst when you find out you've traveled 1,000 miles, lost a large sum of money, and have no where to go all in an instant. Needless to say we dealt with the blows as they were coming. Called family and friends, told them our predicament and held our heads as high as we could. We are resourceful and aren't afraid to talk to just about anyone. Thanks to Logan's dad Norm we had some accommodations for a few days at the Dillon Inn to try and figure something out. In summit county a condo can be filled in a matter of hours and we found out just how tough the scenario is, especially for 2 guys only staying for a few months. We left the mountains on the 1st headed back for TX, and as a guy who makes his winter months living in the snow it was a hard thing to do. We understood that fuel costs right now were in our favor and that free lodging and the ability to cook for ourselves outweighed loosing hundreds of dollars in a few short days staying in the mountains. Our search continues for a place to live, we are not tied down to stay in Colorado but have the ability to head further West to Utah or Tahoe. If ANYONE has a lead, be sure to leave a comment or shoot me an email. Arts and crafts, for car guys? So a little over a year ago a buddy and I decided to Plastidip my car. For those of you who don't know what plastidip is, combine spray paint and rubber and the ability to remove it. Plastidip comes in a variety of colors and now the option to purchase it in gallons and run it through a paint gun. Well, we went the home depot route of purchasing 16 cans of matte black and going for it. The car last winter was pretty epic. Not only did we dip the car, we dipped the wheels and roof box. The amount of thumbs up I received and comments meant I did exactly what I wanted to do. Create a small buzz about the car that could cheaply be attained and not permanent for the summer. Well, needless to say 12 months later an experiment is coming to an end with some conclusions. First, the car came out looking great. for the total invested in making it look like it did I can't complain. Second, If you are going to dip your car definitely do not rattle can it. Although the finished product looked great as I am peeling it right now I can tell it was on way too thin. Causing it to not peel cleanly in giant sheets. Finally, make the investment in the paint gun and gallons. You will be much happier and wont have the spray and pray approach! The STI is up for sale and looking to move onto the next automotive project. The reason the dip is coming off is not too many people are keen on the matte black plastidip scene.